This is how a few of our trucking Twitter tweeps (say that five times fast) responded when asked what they like about hauling goods around the province. Many people love trucks and have the drive to explore B.C.’s diverse landscapes while helping the economy move. Do you? If so, here’s how to get started. You fit the bill if you have a Class 5 or 6 driver’s licence, which are the full privilege licences that allow you to drive a standard passenger vehicle or motorcycle. You also must be at least 19 years of age. Knowledge is horsepower. Before getting behind the wheel, you’ll need to fill your head with all kinds of trucking know-how, from heavy vehicle braking to identifying signs, signals and road markings. ICBC publishes Driving Commercial Vehicles, a study guide for current and aspiring professional drivers. Give it a solid read (or two) and have a friend quiz you on the content. Drop by your local driver licensing office to spill the knowledge you’ve learned on paper by taking the commercial vehicle knowledge test. No need for an appointment, but you’ll need to arrive an hour before the office closes. Hopefully you studied hard because you must answer 28 of the 35 multiple choice questions correctly to receive your Learner’s licence. You can also take your air brake knowledge test during the same visit; that way, you pay only one fee and can practise with air brake equipped vehicles. Before writing the air brake knowledge test, you must pass an air brake course or prove that you already have adequate air brake experience. Now that you have your Learner’s licence, you can start building firsthand experience behind the wheel. There is no provincial standard for truck driving training prior to taking the commercial road test, but you will be better prepared for success after taking a truck driving school program. There are many schools in B.C., varying in terms of course length and hours in classroom, in-cab and on the road. Some schools offer mentorship programs, so best to do your research to choose which school is right for you. You’ve booked your commercial driver road test at your local driver licensing office and filled out all the paperwork. Now it’s go time. The road test actually includes two tests: the pre-trip inspection test, including air brakes, and the on-road test. During the pre-trip inspection test, you will show how to inspect the vehicle and complete a written report. During the road test, you will demonstrate all the trucking skills you’ve learned – everything from starting/stopping, shifting gears, turning, backing up, parking, merging on highways and coupling/uncoupling a tractor unit from a trailer. Now that you’ve earned your Class 1 commercial driver’s licence, you’re ready to roll. But you’ve got some decisions to make. For instance, do you want to be a long-haul driver (typically travelling outside a 160 km radius of home terminal) or short-haul driver (travelling inside 160 km radius)? You likely already made some valuable contacts from your truck school days, particularly if you completed a mentorship program. The road is wide open… is it your time to take the first step? Do u know what to do to get a bus drivers license? I would get my class 3 with air, but there is no way to fund it, or get funding. Its almost useless to even try, unless your a woman or a perceived individual with a high victimhood status. There is a government sponsored program in place to assist new drivers looking for training. Hi, i moved to the nwt for eight years, i left bc with a class 3 drivers license with air endorsemnet, while there i drove dump trucks etc, and upgraded to a class 2 license, which in the nwt covers all vehicles in classes 5, 4 and 3. so no class 2,3 required. upon returning to bc, i was only given a class 2, which in bc only allows me to drive buses and class 5 vehicles. is there a way to get my class 3 back without taking the learners test, road test etc? This seems unfair as i never “gave up my class 3” as it were, and this affects my livelihood as a commercial driver? Thanks for connecting with us here. Unfortunately, this is a question for ICBC. Here is their contact information. Hope this helps! I am an international worker waiting LMIA outside of Canada, and will do work as a long-haul truck driver. I have almost 3-year truck driving experience in my country but I dont have class 1 license yet. when I arrive there, I think I could try the test to get class 1 license. Is there a rule that I have to obtain the license in two months after entry of Canada? The employer said that my visa may be canceled otherwise. Can one eye vision person get class 1 license or not? Hi Amaan on, I looked at the ICBC website, and it does not say anything about whether having only one eye that works, would stop you from obtaining a Class 1 licence. (see further below). I suggest you phone ICBC and ask them: toll free in ​B.C., Canada and the U.S.
1-800-663-3051 or Lower Mainland 604-661-2800. The existence of a medical condition does not necessarily mean you will be ineligible to obtain a commercial licence. It is important that you disclose your conditions during your application process so that an individual determination can be made early in the process. To facilitate this, additional information about any relevant condition that you have may then be provided by your doctor when completing a Drivers Medical Examination Report. I am moving to BC from india. Here in india i have license to drive car, motorcycle and tractor. To be a trucker what i have to do ? Which test i will have to take ? Can i apply directlly for class one test or i will have to clear class 5 test at first . I got a class 1 license and I gave back my class 5 license to ICBC.I did this good or may has anybody 2 license at the time? I have class 4 license and now want to apply for class 1.Actually i have submitted my verification paper from back country. I want to know that how much time ICBC will take to approve my papers? It is more than two weeks i have submitted the documnts,,,its very hard to wait so long for a approval.please let me know about the exact time. Hey Guys, I Just got my Class 1 license and i went through a school. now I’m looking for a job and it seems hard to get one without exp. What should I do? We suggest connecting with the school you went to for opportunities as well as the BC Trucking Association to start. Hope that this helps! I went for my class 4 road test, have driven taxi, tow truck and moving trucks from coast to coast, no accidents in 30 years. Yesterday i got an examiner that appeared to be around 20-25 years old maximum. EVERY single time i did my shoulder check SHE did the check herself and at the end told my i had missed most of my shoulder checks…wow! I did a complete circle of the engine, and being a back yard mechanic (rebuilt many cars and trucks) i told her then engine and all hoses were fine and also i checked the dipsticks and steering / brake fluid. I told her the tires were brand new and also did a inspection on them. I have grown accustomed to what i call a ‘featherstop’ or in other words what they consider a rolling stop. The vehicle in my driving comes to a complete stop cant move cause the brake is applied fully yet you don’t feel it because of ‘no jerking’ This is practiced since as a cab driver we would deal with many seniors that need a soft ride. I checked all the interior gauges and told her all was fine. During the whole trip i made sure not to go over 50-54 in a 50 zone, hard sometimes when coasting when you are on a main drag steep hill and tonnes of traffic behind you. She failed me because of the no shoulder checks, no tire checks, no explanation of the vehicle examining i did. Plus other things. Good scam ICBC has to rake in 40 bucks a crack. Hope that this helps. Thanks for connecting with us here. There is currently a program running for women that are wanting to get into the trucking industry. (Get your class 1) If you quality the YWCA will pay for it. Call the YWCA in Vancouver on Hornby St. for more information. The classes are starting now and maybe later. They will be sending you to a truck driving school. Good luck. We have sent your question to the CVSE – stay tuned! Having driven single axle 7ton moving van in just about every Canadian jurisdiction and most. west US states, I had multiple run ins with local authorities questioning me on this. Due to license reciprocity, I can state this: BC has NO GVW restrictions on your class 5 license. As long as you are single rear axle, you can operate any GVW vehicle. As soon as you go tandem/tridem rears, you need class 3. I ran a moving van single rear with a non air brake trailer (under 4600kg) on a class 5., which would have needed either class 1/A or at least a D license in several other jurisdictions. Hi, I’m thinking of entering into the trucking industry. Does it matter what age to start.Are there trucking companies that hire and train you? I can’t afford the course. We are glad to hear you are considering a career as a professional driver. Have you thought about lessons? They may be able to help you with that with a hands on approach. Thanks for the question. To confirm, do you mean an IELT (international English language test)? Hi, I know that in BC and some other places, women are getting their trades payed for by the government if they choose to do that. Is there any sort of thing like that for women who are looking to get their commercial driver’s license and drive truck? You might want to look into the Jobs Based Training Program, connect with the BCTA or check out BCITA (http://www.itabc.ca/women-trades/programs and https://www2.viu.ca/pdt/courses/esa.asp). Hope these help! We encourage you to connect with the BC Trucking Association to see if they are aware of any programs supporting the development of new drivers. Hope that this helps. Would be valid (fully transferable) in BC. Or would I need to re- do some training? Can a B.C resident obtain a class one with air brakes in Alberta? If you have a specific question around BC regulations, we can certainly help. But if you’re asking us to help you with a test, I don’t know if your teacher or our parents would approve. Can anyone tell me what is a good school to go to for truck class 1 licence. I am new to the field so im not sure what school is best. I live in bc. Also is there a way to get funding for the program for whichever school I go to from the government or from a private partner that I can get a loan from. We can’t recommend one school over the other, but you could connect with ICBC for more information or search for schools that are highly recommended online. You could also connect with the BC Trucking Association for more information on programs and/or funding which support the development of new drivers. Hope that this helps! any funding for class one if your on EI and if not why not I ask the government ? I find you can get funding if your not on ei… who the hell can afford it on ei ? I have a question hopefully you have answers to. If you’re a Permanent Residence and a trucker crossing US border, what document should you have? How is your residence calculated for applying for Canadian citizenship if almost half the time you are not physically in Canada and going back and force US? I need info about class1 liencence. How difficult is it to find a truck driving job when you have the license. I have heard it is very difficult and there are many people for each vacancy. You might want to connect with the BC Trucking Association. They’d be more knowledgeable about the current hiring climate for prospective truckers. To get a job as a trucker with NO exp is not easy. If I was to hire you, you would go through a training program all over again. What you learn in school and what is required of ICBC to get a class 1 is pretty much 10% of what is required to to the real job. We do flat bed long haul with some oversize loads and in school you learn very little to NOTHING in regard to loading. US reg and even Canadian regulation what you can and can’t do on the road. Nothing about duty hours, log books B/L chaining up, if you truck start sliding at 140000 LBS your course of action is totally dif then a car. Every new candidate I have tested have not learned anything about all the legal requirements. This is of course not your fault but ICBC that set a very low standard in order to get a class 1. 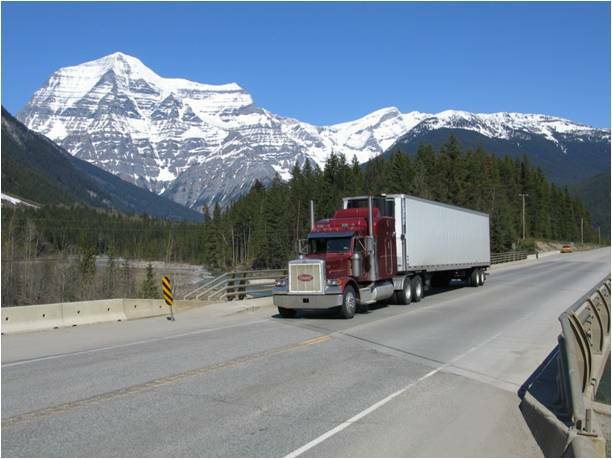 BC’s testing requirements represent current best practices in Canada, with the knowledge and road test assessing some of the necessary industry vocational skills concerning logbooks, pre-trip inspection reports, load securement and fuel efficiency. However, there are limitations in what can be reasonably assessed during the ICBC road test. While it is not possible for ICBC to assess all of the vocational skills and industry qualifications Class 1 drivers need, ICBC does strive to ensure that drivers meet basic driving skills and road safety ability. We agree that classroom knowledge and the ICBC road test are a foundation of a professional Class 1 driver’s skill development and we recognize the value of on-the-job training and experience to understand and apply industry regulations, appropriate load securement in various trailering scenarios and Class 1 vehicle handling in emergency situations. These are all important components to becoming a competent professional driver and are best accomplished with a combination of schooling and industry training and experience, in addition to the ICBC road test. ICBC – In the statement above you quote BC’s testing requirements represent current best practices in Canada. I am currently looking into testing requirements throughout Canada. Could you please send me the link or links where I can get data and information you have on BC’s being the current best practices in testing requirements. Any data on BC’s testing requirements being the best practice in Canada would be greatly appreciated. Thank You Randy. Thanks for connecting with us. We have shared your comment forward with ICBC. Stay tuned. Its no secret that icbc makes millions off accidents, basic training for a 25 ton + vehicle license is absurd. I know that a push for an apprenticeship program (during licensing) from the industry end is in the works. However, I also heard that ICBC is considering a 28hr class 1 program. Crazy! They have class 1 examiners out there without a class 1 licence telling drivers to speed up and slam it in gear etc to keep up with flow. (with a loaded trailer lol) There are driving schools with instructors who have little experience. (non industry people who just have a licence and think they are fit to train) The problem is that we have a company (ICBC) setting min standards, but it is them who stand to gain off the accidents that are caused by these standards. A smart novice would research driving school credentials and after completion, seek more training on a wide variety of trucks in the industry. Nobody is going to learn on 1 truck. There is a dozen different trucks in the logging business alone. Another viewpoint is that after you pass your road test with a semi trailer you are now fully qualified to get in a Truck with a loaded 53′ lowbed. Good luck in the first corner. There is no defending the low standards in both the experience level in the trainers and examiners, but in the programs themselves. Thanks for connecting with us here. We have shared your concerns forward on your behalf. Um Duhh… it’s not hard to piss off ICBC.